Qualcomm's second annual Snapdragon Technology Summit is underway, with the presentations of the first day including the announcement of the Snapdragon 845 and confirmation of Samsung Foundry as the manufacturing partner. During the opening day of Qualcomm’s second annual Snapdragon Technology Summit, Alex Katouzian, Senior Vice President and General Manager of Mobile at Qualcomm, officially announced the Snapdragon 845. The President and General Manager of Samsung Electronics, ES Jung, came on stage to confirm that Samsung Foundry would be the official foundry partner for producing the new SoC to continue the two companies' efforts to improve the silicon manufacturing process. Lei Jun, the Founder, Chairman, and CEO of Xiaomi was also on stage to emphasize their plans to continue using Snapdragon SoCs on their premium tier devices. This included the announcement that their next flagship phone, the Xiaomi Mi 7, will be running the new Snapdragon 845. Rumors regarding the Snapdragon 845 started circling after the release of Apple’s A11 Bionic SoC which benchmarked at more than double the single-core speed of the older Snapdragon 835, and more than one and a half times faster on multi-core (Geekbench 4). The Snapdragon 845 is rumored to be using the same 10 nm lithography as the 835, but will use eight third gen Kryo cores (4 x Cortex-A75 and 4 x Cortex-A53), along with an Adreno 630 GPU. 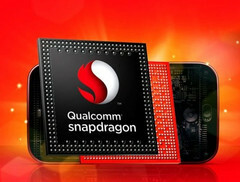 Unfortunately, Qualcomm's presentation was lacking any official specifications with these coming on the 6th of December. We will update this article tomorrow once these details are public. As promised, Qualcomm has now released the specifications of their new Snapdragon 845, and it represents a decent upgrade over the 835. The areas that Qualcomm chose to emphasize gives some good insight into where mobile SoCs will compete over the next few years, now that mid-range chipsets can provide a smooth experience. Up first was the integrated Spectra 280 image signal processor (ISP) that is slated to give improved photography and video quality, such as a claimed 64 times more high-dynamic-range color information. The Adreno 630 GPU and support for 6 degrees-of-freedom (6DoF) plus simultaneous localisation and mapping (SLAM) makes the 845 a good option for phone-based augmented reality and virtual reality. Qualcomm says that AI related performance is improved by three times over the previous generation, although this was a claimed ‘overall’ improvement so it is likely a combination of speed and accuracy metrics. Some key areas influenced by this improvement are on-device voice recognition — such as the keyword activation detection — and AI assessment for photo and video enhancement. Perhaps in a nod to Apple’s Secure Enclave, there is now a dedicated hardware-based secure processing unit (SPU), which acts in conjunction with existing security technology to protect biometrics and user data. The X20 LTE modem is used here to offer ‘gigabit LTE’ at up to 1.2 Gbps, and this speed extends to the new Wifi 802.11ad (60 GHz) standard which provides a theoretical speed of up to 4.6 Gbps in this case. The inclusion of Bluetooth 5 allows for broadcasting audio to multiple Bluetooth speakers at the same time, while also reducing wireless earbud battery drain by up to 50%. Kryo 385 CPU - 4 x 2.8 GHz and 4 x 1.7 GHz cores, 2 MB shared L3 cache and 3 MB system cache, +25% performance.